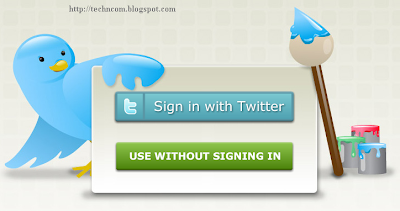 Twitter is a social networking and microblogging website which offers its users to read and send messages called tweets. A user can send tweets within 140 characters displayed on the user’s profile. So, profile background should be smart and attractive to attract the other twitter users to follow you. That means a attractive twitter profile (@rajib882) background can boost twitter followers. But default profile page is not so much attractive. So, you need to design your own twitter profile background. Now you can design your Twitter background with freetwitterdesigner. This tool will help you create free Twitter backgrounds that have the same look and feel as those done by professional graphic designers. It’s easy to use, and best of all, it’s Free! Give it a try! Free Twitter Designer now has the ability to update your Twitter theme automatically! Click ‘Sign in with Twitter’ to try it out. Don’t worry, if you prefer to download it to your computer and upload it to Twitter yourself, you can still do that.